English-language competency is required of all students seeking admission to the Master’s program. If the ATOM administration has any concern about English-language competency, the applicant must achieve a minimum score of at least 61 on the Test of English as a Foreign Language (TOEFL) internet based test (iBT). Credit by examination can be earned through successful testing and the recommended college credit equivalencies of the College Scholarship Service’s AP (Advanced Placement) examinations, the College Scholarship Service’s CLEP (College Level Examination Program) examinations, the American College Testing PEP (Proficiency Examination Program) examinations, PONSI (N.Y. State Department of Education Program on Non‑collegiate Sponsored Instruction), the USAFI (U.S. Armed Forces Institute) program, and the DANTES (Defense Activity for Non-Traditional Education Support) tests. Credit for military and corporate training may be assigned according to the recommendations established by the American Council on Education in The National Guide to Educational Credit for Training Programs and The Guide to the Evaluation of Educational Experience in the Armed Services. No student will be admitted unless he/she has successfully completed at least 60 college (semester) credits from an accredited post secondary institution. As noted in the relevant section of these Policies and Procedures, included within those 60 (semester) college credits must be 3 (semester) credits in each of the following subject areas: (a) Humanities/Fine Arts; (b) Social/Behavioral Sciences; (C) English/Communications; (d) Science/Mathematics. From time to time a student meets the 60 hour requirement yet lacks three semester credits in one of the four above-specified categories. In some limited, special cases, the Admissions Committee may grant Provisional Admission to those students. Provisional status will require the student to rectify any deficiencies in the four specified categories before a Bachelor’s Degree of Health Science or a Master’s Degree of Oriental Medicine can be conferred. The student will be required to earn a minimal grade of 70% in that course in order for the course to be considered successfully completed. If the student on Provisional Status does not complete the required coursework in the four above-specified categories he or she will not receive a Bachelor’s Degree of Health Science or a Master’s Degree of Oriental Medicine. Upon such successful completion of all requirements, the student will be placed in Regular Student Status. Should any student wish to apply for Provisional Status, he/she will be required to execute a written agreement encompassing the above conditions and the student will be required to comply with all other requirements for admission and for continuation as an ATOM student. A completed application form with non-refundable $20 application fee. Photo Identification and a Social Security Card (Photocopied for file). One-page essay describing reasons for pursuing this program and plans for financing three years of study. Two letters of reference sent directly to the Institute from individuals outside the applicant’s family. International students must possess a VISA permitting study in the U.S. for at least the 3- year period required to complete the program. An International Student Application form. All I-20 international students are required to enroll full–time, like all ATOM students, as well as for the purpose of immigration for a minimum of 12 months each year. All questions regarding visa status, accommodations, application for driver’s license and OPT training, etc. should be directed to the Office of International Students at the Institute. International students must also submit a Declaration of Finance form to be completed by their banks. This document must show sufficient financial resources, with a minimum of US$ 28,500 for one academic year to cover education and living costs. Students in the Master’s program may be awarded transfer credit for academic experiences from other educational institutions that are accredited by an accrediting agency recognized by the US Department of Education and that meet or exceed the course requirements of ATOM’s Master program, subject to the following guidelines. Course content must substantially match an ATOM course. It is the responsibility of the student to provide course descriptions and syllabi as necessary for ATOM to assess whether the prior course work is substantially similar to a course in the Master program to justify the award of transfer credit. Grade must be equivalent to 70% or higher. Contact hours must be at least 85% of the ATOM course hour requirement. 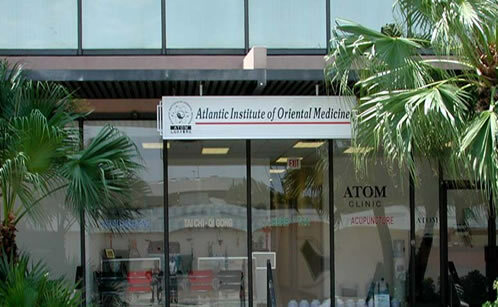 Students awarded transfer credit for a course equivalent to one offered at ATOM will be granted credit for the number of hours that the Institute’s course earns. A student seeking transfer credit may be required to demonstrate knowledge and skills through challenge exams in order to be granted credit. Master’s Program transfer students must take a minimum of one academic year at ATOM to be eligible for ATOM’s Master’s degree. Therefore, no more than two calendar years of transfer credit can be accepted toward completion of Master’s program requirements. Candidates seeking transfer credit from a qualified acupuncture institution must have his/her relevant transcripts from that institution evaluated by the Academic Dean.